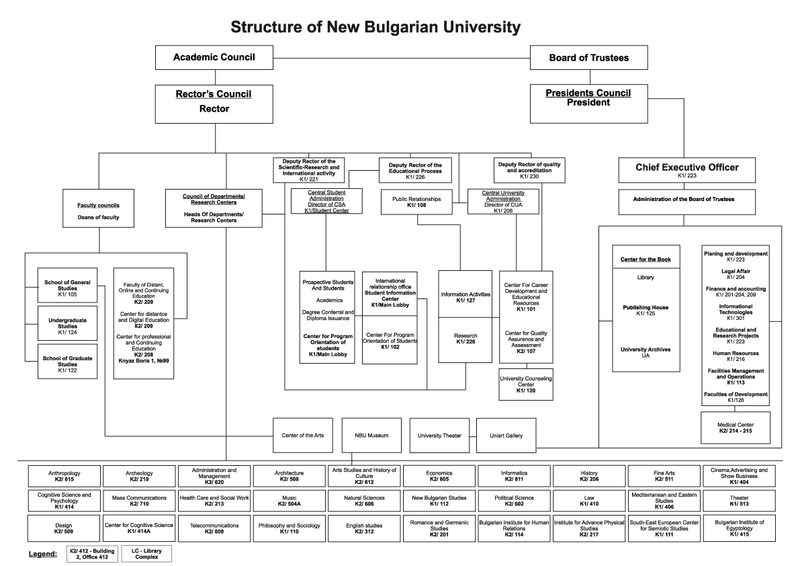 New Bulgarian University is situated in Ovcha Kupel, a district in south-west Sofia, at 21 Montevideo Street. The university campus consists of two buildings (Building 1 and Building 2) housing the Aula, Library, University Theater, NBU Museum, UniArt Gallery, Medical Center with a First-Aid Room and a Dental Office, Sports Center, coffee shops, a restaurant and a Bulgarian Posts branch surrounded by trees and with large open green spaces. Campus and facilities development at NBU is aimed at ensuring modern teaching and learning conditions satisfying the most stringent quality standards. NBU has more than 100 halls, computer labs, language and simultaneous interpreting labs, a Mock Courtroom, an Arts Center with practice rooms and studios for students of music, fine arts, design and architecture with a total capacity of 2,500 seats. Teaching and research at NBU is supported by a variety of fully-equipped laboratories for information technologies, informatics, telecommunications, neuroscience, gemology, animation, usability of products and services, experimental psychology, sociological and socio-anthropological research, photography, foreign language teaching, graphic design and animation, biology and chemistry. NBU also has a University Film Center and a University Theater. Some of the halls bear the names of famous scholars and artists whose archives have been donated to NBU: Prof. Ivan Sarailiev, Prof. Petar Mutafchiev, Prof. Vasil Stoilov, Prof. Konstantin Katzarov, Prof. Tzeko Torbov, Prof. Georgi Mihailov, Prof. Raina Mihailova, William Gladstone, Assoc. Prof. Boycho Kokinov. The University Aula is the place for official ceremonies, academic lectures, international conferences, film festivals, concerts and master classes. It offers a variety of modern audiovisual facilities, interpreter booths, an organ and a grand piano. NBU academic staff and students have at their disposal over 350 computers for educational purposes and self-study. All NBU workstations, including those in the Student Computer Centers, are linked to the Internet and have access to the University Library and its online resources. There is free WiFi in all NBU buildings, halls and labs. In the common areas of NBU students and teachers present exhibitions of their own works. Smooth communication process in the modern academic and administrative university environment is facilitated by the integrated information system, allowing continuous access to necessary data. In building 2 of NBU there is a medical center with a doctor and a dentist . The University has two photocopying centers: a technology center MINOLTA and a copy center XEROX; bookshops, coffee clubs, a bio-cafe and a restaurant. The NBU Library is located on three floors and represents a cultural and information center. It is supplied with special reader equipment for people with impaired vision. The university is supplied with facilities, providing access for physically disabled people to the university resources. During non-academic periods New Bulgarian University can rent the university premises to external users for carrying out of various events. The facilities and the technical equipment are suitable for conferences, seminars, presentations, business meetings, etc. As additional services the university offers a theater hall, copy center, internet connection, technical equipment, parking lot, sports facilities. Different offers can be made according to the needs and preferences. A large part of the lecture halls and laboratories are in building 1. It is the office of the Honorary Chairman (President), Chairman of the Board, Executive Director, Rector, Vice-Rectors, as well as the offices of the faculties: School of General Studies, School of Undergraduate Studies and School of Graduate Studies. In this building there are also the Student Center and Publishing Center, a bookstore and some of the offices of the departments and the research communities at NBU. The Aula is the place for official ceremonies and academic activities. Students, teachers, guests and administration staff can relax in a spacious café-bar. Next to building 1 are the sports complex and the library. Building 2 has lecture halls, laboratories, department and administrative offices. Important events are held in the lecture halls which are equipped with modern facilities and offer excellent conditions for learning. Here is the medical center with a dentist and a doctor. In building 2 there is a teachers’ hall, the center for quality and evaluation, as well as the office serving the student and staff mobility program "Erasmus +". In 2006 the interior of building 2 has been substantially updated. In 2013, after the expansion and reconstruction, the lobby has been transformed into a social space of a new type: with an open space bookstore, bio-cafe, bakery and recreational area. The university theater officially opened in February 2010; it accommodated the wandering Slug Theatre and is the newest theater in Sofia. The theater hall is multifunctional and hosts theater plays, cinema screenings, concerts, lectures, debates, etc. Its capacity is 120 seats arranged in tiers. The lighting facilities and audio and multimedia systems can be reconfigured depending on the arrangement of the seats and the performing space. The Dolby surround sound system allows the screening of films with high sound quality. The hall has Internet connection and a high-tech air conditioning. The University Theater expands the concept of "doing theater", rediscovers theater audiences and is targeted at young, open-minded people who like good theater. NBU UniArt Gallery opened on 19 May 2012, the Day of Museums and Galleries. Most of the exhibits have been donated by the family of Bojidar Danev, Executive Chairman of the Bulgarian Chamber of Commerce and member of the Board of Trustees at NBU. The permanent exhibition consists of the collections "European painting", "Contemporary Bulgarian sculpture" and pictures of Ivan Kirov (1932-2010). The collection "European painting" is without analog and includes works by Dutch and Flemish artists of the 17-19 century period. The temporary exhibitions allow the audience to get acquainted with innovative trends in contemporary visual art. In Bulgaria it is not common for universities to have their own gallery and art collections and this makes UniArt a unique university exhibition space. In the gallery NBU students can get familiar with the works of classic and old masters, develop their projects, attend seminars and take part in intern programs. Here are held various events of academic and cultural nature, lectures, thesis presentations, readings, book presentations, master classes, chamber concerts and special educational programs. Every Saturday there is a Children's University for children of different ages. NBU Museum opened on 23.04.2010 with the exhibition "The richness of museum network." The space for the presentation of collections was created with the project "Teaching Museum of New Bulgarian University" headed by Assoc. Prof. Tatiana Shalganova. The project was funded by the National Science Fund at the Ministry of Education, Cultural Heritage Program. The educational museum is a new form of museum activity, binding it more closely with education. Its mission is to provide practical training of students from different social and humanity programs at NBU. Each semester in the museum hall there is a new temporary exhibition selected and performed by students themselves. Thus they acquire knowledge and skills for their future profession. The aim is to strengthen and optimize the process of learning and to combine formal teaching with practical work in the museum space. The integration of youth into the activity of the museum nurtures positive attitude and commitment to the cultural heritage of Bulgaria. It is in the museum where students can get acquainted with the technology, iconography and style of the monuments of ancient culture and the works of contemporary art. Here they can acquire knowledge and skills in the field of museum studies, the organization and arrangement of exhibitions, as well as public advertising campaigns . In the museum students can become familiar with the history and culture of our land and have access to scientific and educational projects developed by the Museum’s team. The University Aula has 240 seats. It is equipped with a multimedia projector, screen, computer, sound system, wireless and stationary microphones, a portable simultaneous interpretation system and a piano. The places for the audience are arranged in tiers in two sectors; in the central part of the stage are the sign of New Bulgarian University and its motto Ne varietatem timeamus. The Aula is a place for official academic ceremonies like the opening of the academic year, graduation ceremonies, the conferring of honorary titles, etc. Thanks to its hi-tech cinema projector every Thursday it becomes a cinema club. The Aula is used for both teaching classes and significant events like seminars, conferences, meetings.